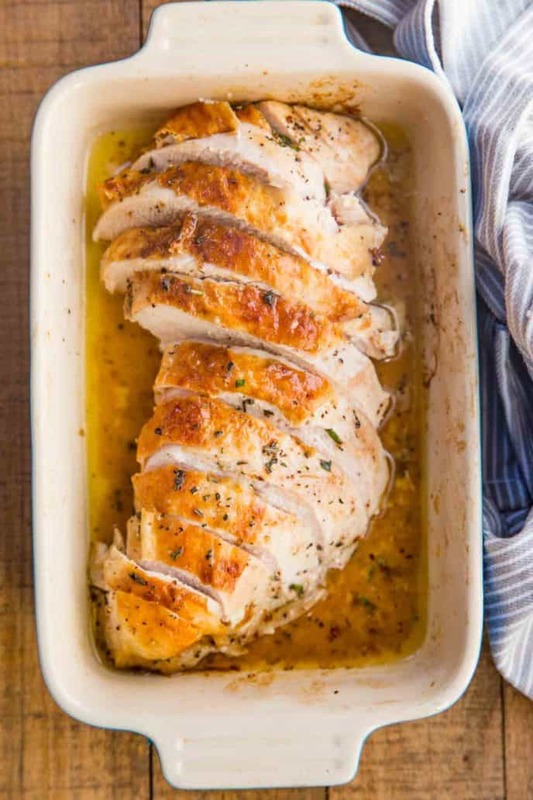 Roasted Turkey Breast made with butter, herbs, salt, and pepper has tender juicy meat and CRISPY skin, and roasts in only 90 minutes! It’s officially turkey season in our kitchen, and we’ve been cooking them up all week to prepare for Thanksgiving! 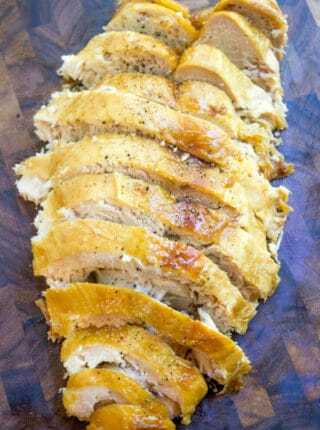 Just in case you need some FAST last minute turkey ideas, check out Spatchcock Turkey, Easy Roasted Turkey Thighs, and Crispy Slow Cooker Turkey Breast. 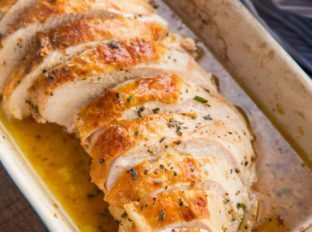 Roasted Turkey Breast is my go-to choice when I have to cook for the holidays, but don’t have much time to prep and roast a whole turkey. This is also a great last minute option if you didn’t buy a whole turkey in time to defrost it properly. It’s Thanksgiving morning, are you in a panic? 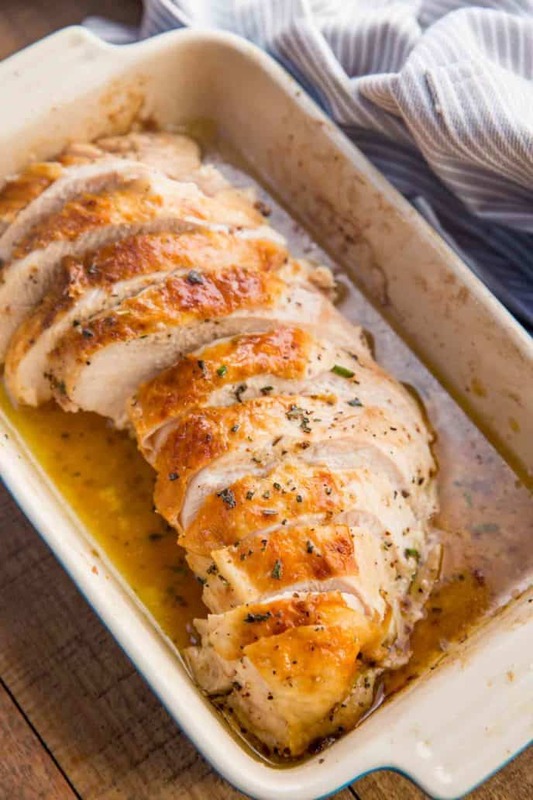 This turkey breast recipe is your saving grace! 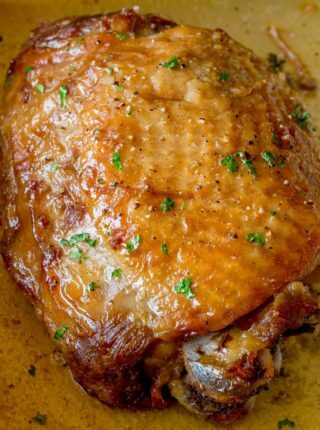 Plus if you serve it along side my Crispy Slow Cooker Turkey Thighs your family won’t even miss the whole bird! The holidays can get a little crazy in this house, with family coming in and coordinating schedules, so I totally get it. Turkey breast is just as good as a whole turkey, but it’s ready in only 90 minutes. It’s also a great option if you need a little bit more to feed a crowd but don’t want to cook an entire second turkey. All you have to do is season some butter with herbs, salt, and pepper, then rub it under the skin, and get it in the oven. 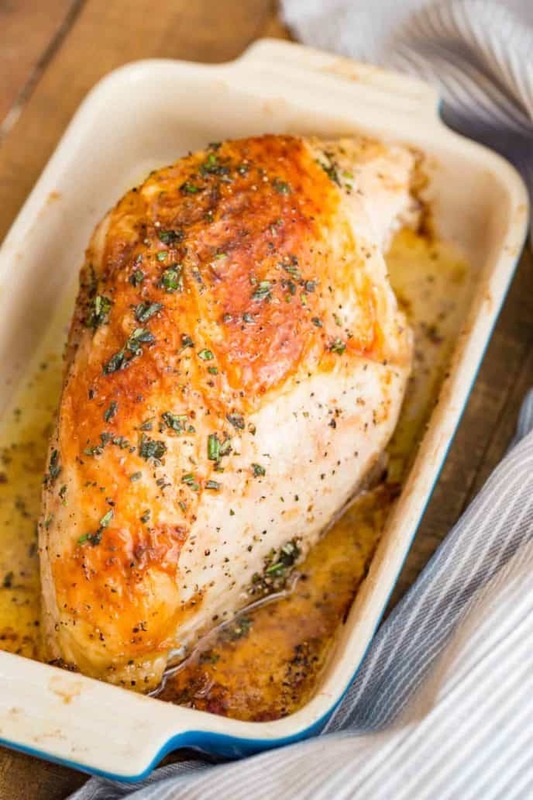 The seasoned butter is a chef-approved restaurant trick that makes the meat incredibly juicy and flavorful, your guests will think you had it catered. Plus you get mostly white meat, which is better for making turkey sandwiches the next day like my Moist Maker! HOW LONG DOES IT TAKE TO ROAST A TURKEY BREAST? A turkey breast takes about an 1 to 1 1/2 hours to cook per 4 pounds of meat. So if you get an 8 pound turkey breast, your cooking time will be more like 3 hours. The most important thing is that you use a meat thermometer to check the innermost part of the turkey breast for food safety. It’s done when the temperature reaches 165 degrees F.
You want to make sure you have about 1/2 to 3/4 pound of turkey breast per person, so a 4 pound breast will comfortably feed about 6-8 people. If you’re going to have a larger group, you’re looking at an 8 pound turkey breast, or just go for the whole turkey. But most importantly, make sure you have enough for leftovers. Leftovers are basically mandatory on Thanksgiving, right? 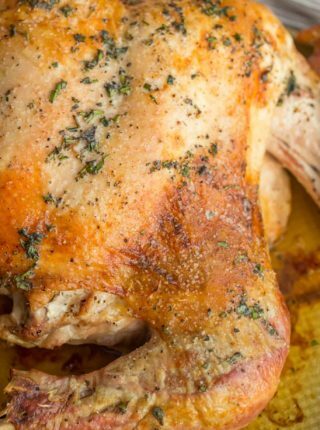 You can use other other flavors or herbs like sage and lemon to the butter to add extra flavor, or season the turkey breast with spices like my Cajun Roasted Turkey. It’s entirely a personal preference. 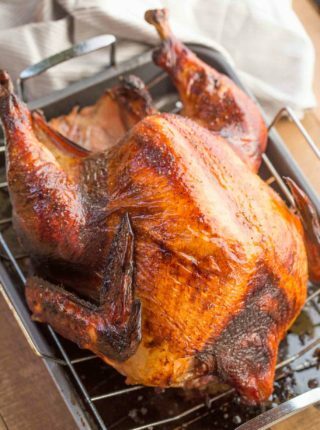 Roast your turkey breast skin-side-up, to give it a chance to get really crispy when it’s roasting. You should have more than enough pan drippings for homemade gravy, too! ALWAYS check your turkey with a meat thermometer to make sure it gets to 165 degrees F for food safety. Another visual indicator is that the juices will start running clear when the turkey is done. You don’t have to cover the turkey breast with tinfoil because it’s only going to take 90 minutes to roast, so the skin will be extra crispy by the time it’s done! Preheat the oven to 325 degrees. Set up oven so there is only the bottom rack. Add the turkey breast to a large roasting pan and pat dry with paper towels inside and out. Mash the butter, herbs, salt and pepper in a small bowl. Set 2-3 tablespoons aside for later. Use the back of a spoon to lift the skin from the turkey breast and spread butter inside. Smooth the skin back down to spread the butter all over the breast. Be careful not to tear the skin as the butter will drip out when cooking. Roast for 90 minutes, or until the innermost part of the breast is cooked to 165 degrees (this is vital for food safety). Top with remaining butter and let rest for 20 minutes before serving. Would dried herbs work ok instead of fresh? Yes but dried herbs have a much more concentrated flavor, so the general rule of thumb is to use a third of the amount of dried as you would fresh herbs. Enjoy! Trying this tonight. Our turkey is skinless so I’m covering it with bacon. Will let you know how it turns out. Looks absolutely delicious….is this for a bone-in turkey breast? Was yours a boneless turkey breast? This was a perfect holiday turkey breast. Thanks for the recipe! Mmmm, so moist and flavorful, great recipe! This looks absolutely perfect, and great for people not wanting to make a whole turkey!